NSC207895 is a cell-permeable benzofuroxan compound that downregulates the p53 negative regulator MDMX protein level in MCF-7, LNCaP, and A549 cells (1 to 10 µM for 16 to 24 h) by suppressesing MDMX promoter transcription activity (IC50 = 2.5 µM in HT1080 cells), leading to enhanced p53 stabilization and activation. p53 and MDM2 proteins-interaction-inhibitor racemic is an inhibitor of the interaction between p53 and MDM2 proteins. p53 and MDM2 proteins-interaction-inhibitor chiral is an inhibitor of the interaction between p53 and MDM2 proteins. MI-773 is an orally available MDM2 antagonist with Ki of 0.88 nM. AMG 232 is a highly potent, selective and orally bioavailable piperidinone inhibitor of the MDM2-p53 interaction((SPR KD= 0.045 nM, SJSA-1 EdU IC50=9.1 nM). Idasanutlin is a potent and selective p53-MDM2 inhibitor. Nutlin 3b is a p53/MDM2 antagonist or inhibitor with IC50 value of 13.6 uM, 150-fold less potent (+)-enantiomer of Nutlin-3 as in comparison with opposite (-)-enantiomer Nutlin-3a. Nutlin 3a is a potent inhibitor of MDM2 (mouse double minute 2) binding to p53 that induces the expression of p53 regulated genes, and shows potent antiproliferative activity in cells expressing functional p53. SJ 172550 is the first MDMX inhibitor with EC50 of 0.84 uM; binds reversibly to MDMX and effectively kills retinoblastoma cells in which the expression of MDMX is amplified. RG7112 is the first clinical small-molecule MDM2 inhibitor designed to occupy the p53-binding pocket of MDM2. 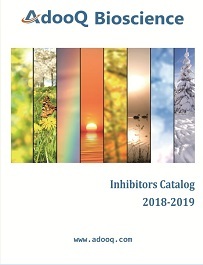 MI-773 is a new small molecule inhibitor of the MDM2-p53 interaction, binds to MDM2 with high affinity (Ki=0.88 nM) and blocks the p53-MDM2 interaction. NVP-CGM097 is a potent and selective MDM2 inhibitor; an orally bioavailable HDM2 antagonist with potential antineoplastic activity. Kevetrin (thioureidobutyronitrile), is a water-soluble, small molecule and activator of the tumor suppressor protein p53, with potential antineoplastic activity. MDM2 Inhibitor is a cell-permeable boranyl-chalcone exhibiting strong binding to MDM2 and irreversibly disrupts the MDM2/p53 protein complex. MX-69 is the MDM2/XIAP inhibitor, used for cancer treatment.